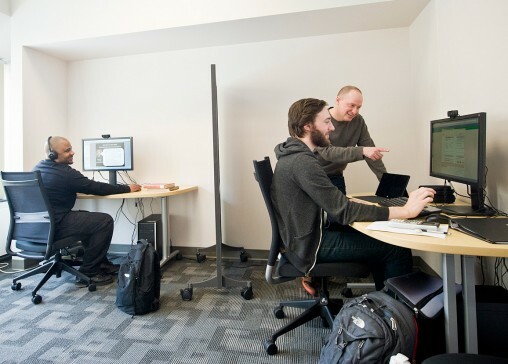 The eLearning Studio provides a space where students "can take an online course with the confidence that the technology and support they need are at their fingertips," says STAC Coordinator Will Davis (far right). Wright State University’s Student Technology Assistance Center, or STAC, will showcase its new space for online learners when it celebrates Digital Learning Day on Wednesday, Feb. 5. Last semester, the STAC, in the Paul Laurence Dunbar Library, opened the eLearning Studio to provide a comfortable place and support for online learners. The studio includes three workstations and can accommodate up to six students at one time. Its software and hardware, including microphones, headphones and webcams, were specifically selected to meet the needs of students taking online classes. STAC Coordinator Will Davis designed the eLearning Studio to fill a need on campus. Students have used the eLearning Studio to take a myriad of online classes. Some students use one of the studio’s workstations until they get comfortable taking their course on their own, while others have standing reservations to use the equipment regularly. Though students often choose take online courses independently, Davis has found that the studio helps the students have a shared experience and build community. Since opening the studio has become a popular and reliable resource for students. “We’ve been testing it for a semester and everything is working as it should,” Davis said. Students can make reservations to use a workstation or can drop by during the STAC’s regular hours. To reserve a workstation, call 775-2656. Students and faculty can learn more about the eLearning Studio and the STAC during an open house from 2 to 4 p.m. on Wednesday, Feb. 5. The STAC will give away a $15 iTunes gift card every 15 minutes (limited to Wright State students). Faculty are invited to see the new eLearning Studio and learn more about how the STAC can serve their students.